I have loved farmers’ markets for years. There was a nice urban market a couple of blocks away from the office where I worked for the past several years (before I took leave for the sabbatical I write about here). Every Friday in season I would drag one or two of my colleagues over to check out the market and see what was happening. Inevitably I would receive grumbles from a colleague who just wanted to grab a quick bite to eat at lunch time. But soon I was winning converts for the unique pleasures or fresh locally grown produce and the community atmosphere these markets provide. I liked going every week and seeing the season progress from those first early greens, to the abundance of late summer and the late arrivals right when the market packed up for another season in early November. Now with more time, and living in an area where farming is still a major occupation, if I choose, I have the luxury of visiting a farmers’ market just about every day of the week within a reasonable distance of the house. I will be blogging here and there about the various markets, the people I have met and the items I have found. 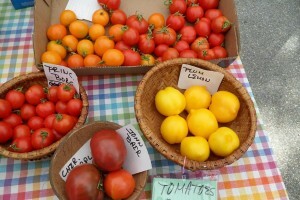 Today, I would like to rave about the plum lemon tomatoes I discovered recently at the wonderful Farmers’ Market in Tamworth, NH. I was attracted to the lovely display of tomatoes presented by a local grower, Mivida Gardens, and fell in love with the beauty of this small tomato that looks like a lemon. I was curious about this beautiful fruit and was told that it had a “sweet and mild” flavor and was perfect for stuffing. 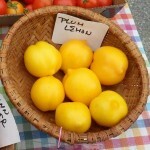 I had never had a plum lemon tomato before, nor had I ever stuffed a tomato, so of course I had to try them. I was with my good friend Lynda who was up for a weekend visit and she encouraged me to try stuffing the tomatoes that very night for our dinner. But what to stuff them with? Enter the Big Love Mexican Diner food truck parked nearby at the market. Big Love is worthy of their own post – which I promise to deliver soon – but for now they were the source of the unique stuffing for my tomatoes. Lynda and I decided to try Big Love, a purveyor of Mexican-style food made with fresh local ingredients. We purchased a burrito and a few sides, one of which was a chorizo/potato hash. Our plan was to order the food and save it for our dinner. While discussing how to stuff the tomatoes, Lynda suggested using the chorizo hash. It sounded perfect – so that’s what we did. I took the tomatoes and carefully sliced them in half lengthwise. I cut out the middle section – the white-ish part with the seeds – and placed them open side up on a small roasting pan. I brushed the tomatoes with a light dose of extra virgin olive oil and placed them under the broiler for about 5 minutes. Next, I took small spoonfuls of the hash and placed it loosely into the tomatoes. I pushed the stuffed tomatoes together and topped them with the remaining hash and placed them back under the broiler for another 5 minutes. The result was awesome: the sweet and tender tomatoes mixed with the spicy chorizo hash was a perfect combination. The tomatoes cooked this way were so delicate they melted in your mouth and allowed you to appreciate the complimentary flavors of the hash. What did I learn? Once again, if you are not afraid to try new things and experiment, you may discover your new favorite thing. I highly recommend seeking out these plum lemon tomatoes, or any tomato that lends itself to stuffing and finding something fun to put into them. Let your imagination fly! There is nothing like a summer vacation spent by the sea. Many of us dream of owning our very own seaside retreat, decorated just like we imagine the best summer homes are outfitted. As lovers of New England here at Lost Cowboy, we fancy our summer home to be on the coast of Cape Cod, Maine, or indeed, on the tiny coastline of our great home state of New Hampshire. Anyway, this is all set up for a store we have found in Rye, NH and on the internet, the aptly named Summer House Furnishings. At Summer House Furnishings you’ll find everything you need to make your summer home the vacation retreat you always imagined. Everything you need is here – from furniture to accessories, and design services for the decorating challenged among us. We love the look and style of what Summer House Furnishings offers. We particularly like their well-curated collection of art and vintage items that fit the summer house theme. 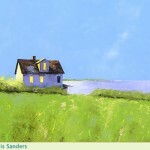 Check out the art and vintage section of the Summer House Furnishings website. See everything Summer House Furnishings has to offer here. Lost Cowboy is powered by	WordPress 5.0.4 and delivered to you in 0.784 seconds using 44 queries.